How many violations can you find? Click on the image above to go the game on the fine homebuilding website. Then click on any and all safety violations you can identify. How fast can you find them and what’s your score? 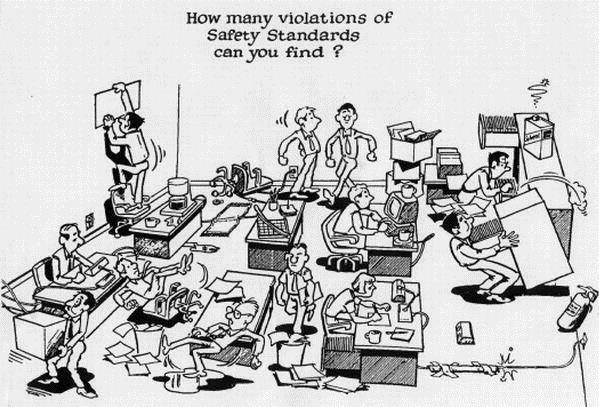 We’ve highlighted this fun way to spot potential safety issues in the past on this blog. This week, “The Inspector” goes to the roof. Spot the 5 potential safety hazards (click on the image to go to the finehomebuilding site to play the game). By the way… there are at least 2 more that I spotted that weren’t even listed, the most obvious one being that no one is tied off which according to the new standard is now an absolute must. Do you send violators home with pay? One of the discussions that I’ve been involved in online, in a safety forum, has to do with sending safety violators home with pay when there is an infraction. The idea apparently comes from E. Scott Geller in his book “The Psychology of Safety” and it has generated quite a bit of discussion. On the one hand, there are those who claim that sending someone home with pay when they violate safety procedures, they are essentially being rewarded for bad behavior and that others are going to do something similar in order to get paid time off. On the other hand, however, there are those (and I am among this group) that claim that punishing employees in order to get people to comply has been proven ineffective time and time again. Punishment generates fear and actions that are brought about by fear is not the type of safety culture that you want to create in the workplace. One person from the “punishment” camp (for lack of a better word) even advocated punishing the supervisor when a violation occurred from someone who was under them. Another person, in the “paid time off” camp claims that they’ve had good success with sending the employee home with pay but with a homework assignment the involves coming up with a “written corrective action plan” which he or she would have to present the following day to the safety committee. This person claimed that safety “improved exponentially” as a result of this way of dealing with safety violations. The discussion continues but I felt that this was something that might be of benefit to my blog readers. It goes against the way most of us think when it comes to safety violations. Rather than assuming that the violation was intentional this new approach allows the company to give the employee the benefit of the doubt and remove the “punishment” (and hence the fear) while moving towards a corrective measure that the employees themselves come up with and therefore own. It allows the employee to save face while making it clear that they need to be responsible for their actions and help come up with corrective actions that will keep them and others safe in the future.